What makes a coach truly stand out is producing a result in the face of adversity when it really matters, and that is exactly what Schalke boss Domenico Tedesco did at Borussia Dortmund. It was a managerial masterclass that earned the tactician the honour of Matchday 13's Man of the Matchday. Four goals down to their fiercest rivals after 25 minutes, there was no hiding place for Schalke in the Revierderby at the Signal Iduna Park on Saturday. The Royal Blues needed inspiration from somewhere, and they found it in the form of their 32-year-old coach. Despite a run of only one win in nine matches, Dortmund raced out of the traps and into a four-goal lead, their every attack looking like it would produce a goal. Schalke were overrun, constantly out of position and gripped by a state of panic. Crucially, however, their coach remained calm amid the chaos in front of him and, like a true leader, acted decisively. Tedesco made a double-change on 33 minutes, introducing Leon Goretzka and Amine Harit in place of USA international Weston McKennie and Franco Di Santo, and then took Thilo Kehrer out of the firing line at the break after the youngster had been completely overwhelmed in the opening 45 minutes. We have goalkeeper Ralf Fährmann to thank for shedding light on what transpired in the Schalke dressing room at half-time. “The coach called us together and we sat really tightly. Then he knelt down in front of us and said that we had to learn from the game right then and there, that halves of football like that can always happen. Inspired by Tedesco’s speech, the Royal Blues slowly but surely established an element of control after the break. Benjamin Stambouli atoned for scoring an own goal when his long ball was headed in by Guido Burgstaller, and four minutes later, Tedesco’s first change reaped reward as Harit finished from a Yevhen Konoplyanka cross. After Pierre-Emerick Aubameyang was shown a second yellow card, Schalke started to believe. Daniel Caligiuri curled into the top corner and Naldo headed home in the 93rd minute to complete a scarcely believable comeback. The willingness of the players to give their all for Tedesco is undeniable and their belief in his abilities unquestioned. Harit hobbled off late on in the game but played on in visible pain as Schalke had already made their three substitutions, while Fährmann has previously spoken of Tedesco's “God-given gift” for coaching. The respect for the man in the dugout is total, and though he may be strict, he also knows when to let loose, cancelling training on Sunday to allow the players a night out to celebrate. After their exertions, the players have also been given a day off on Monday. 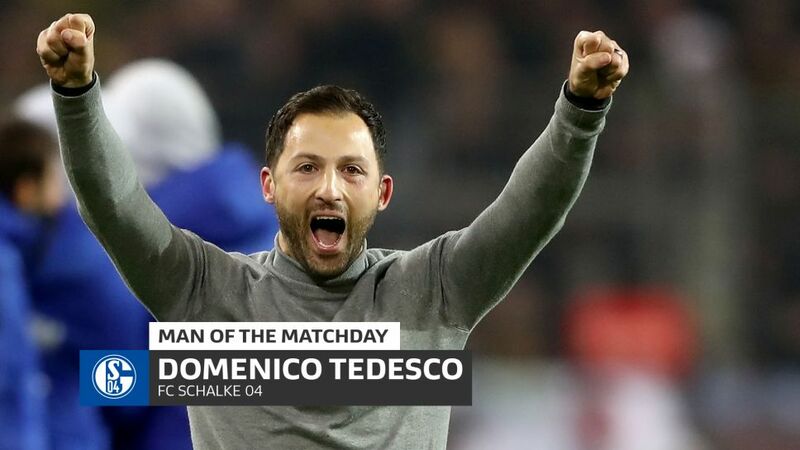 A studious coach who pores over videos of the great AC Milan tactician Arrigo Sacchi, and seemingly has man-management down to a tee, Tedesco is the most important man at the club and Schalke are much the better for it. The future looks bright indeed under this 32-year-old prodigy. Click here for more Schalke news and features!